Feeling Gloomy? Maybe Things On Earth Aren't As Bad As You Think : Goats and Soda That's the view of Michael Elliott, head of Bono's anti-poverty group One and a delegate to Davos, where leaders and activists are gathering this week to hash out solutions to the world's ills. 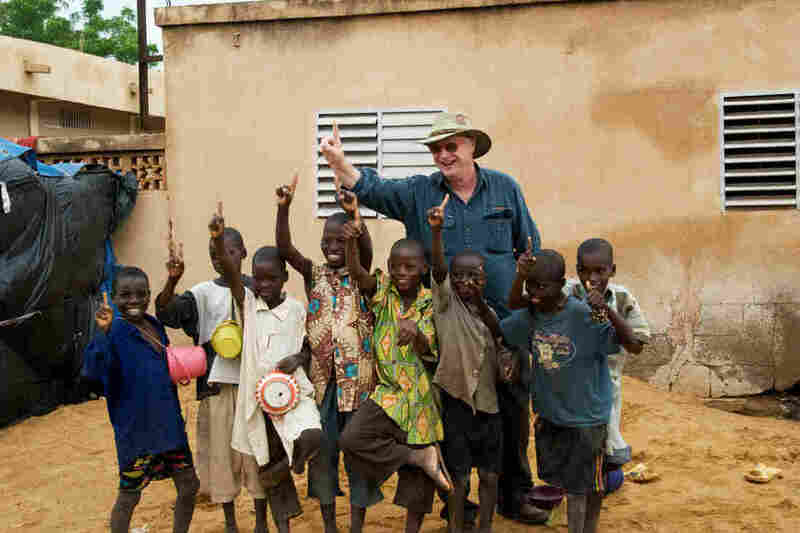 Michael Elliott poses with a group of children during a trip to Segou, Mali. One reason for his optimistic outlook is the dramatic drop in deaths of children under age 5. If you want to be a pessimist about the shape the world's in, just turn on the news. It seems as if we're living in an age of terrorism, war, refugees, hostages and natural disasters. If you want to look on the rosy side, read Michael Elliott's essay on Time magazine's website: "The Age of Miracles." The former journalist, now head of Bono's global advocacy group, One, tells of the progress he's seen: from the dramatic drop in the death of children under 5 to the incredible growth of cellphones in Africa. Elliott is in the Swiss Alps this week for the World Economic Forum, which starts on Jan. 21 in the city of Davos. Some 2,500 world leaders and visionaries are there trying to figure out how to solve the world's overflowing plate of problems, from poverty to climate issues. We spoke with Elliott about his goals — and his optimism. How do you manage to look on the bright side in these difficult times? I am struck by how far we've come. When I am talking to a group of 20 or 25 people, I always say, if there were this many people sitting around a table 10 or 12 years ago and everyone had HIV/AIDS, and we said, "What do you think the next 10 years will be," they would say there's going to be a pandemic, [AIDS] will wipe out the middle class in Africa, there's a hidden burden of disease in India. And here we are 10 years on and we can literally use the phrase "the beginning of the end of AIDS." That is completely astonishing. It's more than one's natural optimism — it's facts and data. But I do wake up believing that the world is a little better today than it was yesterday. My sense is that many Americans are a bit more pessimistic about the world's progress than you are. You probably have to see it up close. I lived for a few years in Hong Kong. In Asia, the improvement in people's lives is very tangible: the transition from a hut that is open to a house that is at the mercy of the seasons, to a handheld fan to a room fan, to central heating to central air-conditioning. The transition from having scooters to having a car, from working 6 1/2 days a week to 6 days a week to 5 days, to having vacations, to going to Australia for a week. When you live in Asia you're very conscious that literally hundreds of millions of people have gone through this transition in not much more than a lifetime. You're very conscious of the dreams they have for their kids, the opportunities that are present for their children that were not present for their parents. Particularly in greater China there is this astonishing sense of an unlocking of women's potential. I've seen in Beijing old women hobbling around with bound feet. I now live in the middle of Georgetown [in Washington, D.C.], and there are absolutely brilliant mainland Chinese scholars at Georgetown University whom I see making their way down M Street and looking at their cellphones. That is a phenomenal shift in a remarkably short period of time. And you say now you're seeing a similar upward swing in Ethiopia. I worked for The Economist for years. The way economics reporters do a test of economic activity is count the number of cranes. Last time I was in [the Ethiopian capital] Addis Ababa, the sky was just a forest of cranes. Everywhere you looked, someone was building something, with all the dust and mayhem and half-built roads and potholes that that implies. So it's a muddle in some ways but a muddle of tremendous activity and drive and progress. At Davos this week, the goal is to come up with SDGs — sustainable development goals. There has to be a better phrase! I know what you mean. It is not perhaps the word that is going to get millions of people behind banners marching in the street. I can see why the U.N. in its wisdom went in this direction but, sure, I take your point. Goals for a better future for the planet and its people. Basically, that's what we're trying to do. The international community, which has not been real great at doing big agreements in the last few years on trade or climate or many other things, really has an opportunity here to step up and do something substantial. What's one of the most important goals? A lot of us are concentrating on the elimination of extreme poverty by 2030, and on an agenda that stresses child health and maternal health. How do you define extreme poverty? In statistical terms, it means living on $1.25 a day. In real terms, it means backbreaking labor, it means lack of secure shelter. And those two words are both important: the lack of shelter and the lack of security — from the weather and from other things that visit danger upon you, whether that's the natural environment or rampaging warlords or troops. Extreme poverty will often mean going to bed genuinely feeling hungry, and it will certainly mean going to bed tired. I was asked to be a judge of a photographic competition in Hong Kong, and the topic they gave the photographers was poverty. Now this is Hong Kong. Hong Kong is not a place of the grinding poverty you see in sub-Saharan Africa. But the really extraordinary thing in all the photographs is how tired people looked, the sheer exhaustion of getting through the day when you don't have the resources in terms of food, clothing, shelter and security. One of the consequences is you're just bloody exhausted. I'm sure you must always get questions about Bono's commitment to global activism. We obviously don't like talking about that too much. He can talk about it himself. His passion, commitment, leadership and inspiration and engagement on these causes are mind-blowing. At Davos, do people ever feel guilty about gathering in Switzerland (with I assume plenty of good food) to discuss poverty? You know, I've heard every joke about Davos over the years, every single one. But it does remain this extraordinary collection of 2,500 people. It's a very efficient week to get a lot done in a short space of time.